Cell division is a process that is necessary for microbial growth. It starts with a single cell that stretches in size until it separates into two separate cells, in a process called binary fission. Each new cell is equipped with the right amount of proteins, nutrients, and importantly, the chromosome, to function as an independent cell. In preparation for cell division, a cell makes more peptidoglycan and membranes to support cell lengthening. In general, the cell increases in volume. The genetic material of prokaryotic cells is typically stored in a single circular chromosome. The cell makes a copy of this chromosome, one for each cell after division. 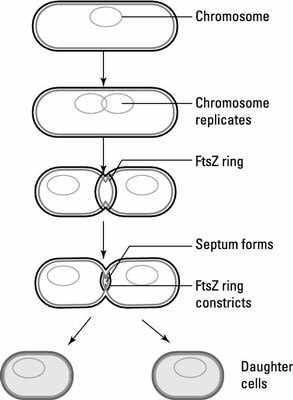 A structure called the Z ring is made from the protein FtsZ and assembles around the center of the cell. The chromosomes and other cellular contents are distributed to opposite sides of the cell. The Z ring constricts inward in the middle of the cell, and the septum (dividing wall) between the two new cells is formed. The cell wall is pinched off to complete division and gives rise to two new daughter cells. The time it takes for one cell to divide into two is called the generation time. If E. coli is given a rich supply of nutrients, its generation time is 20 minutes. This means that if a single cell of E. coli is grown for an hour, it will become eight cells (three generations). This increase is called exponential growth and is one of the phases of growth.